LONDON — Britain is mired deep in its most serious political crisis in a generation. Almost three years ago, the country voted in a referendum to leave the European Union. But with lawmakers deadlocked on the issue, many believe that the only way out of this morass is to ask the people again. 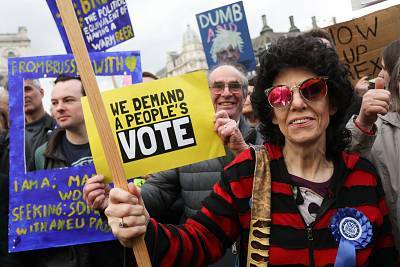 The idea has gained momentum in recent weeks, from a demonstration that flooded the streets of London last month to senior members of Prime Minister Theresa May's own government now saying a new referendum should be seriously considered. Such a drastic move would provoke uproar among pro-Brexit supporters. However, the idea of holding another referendum now seems far less implausible than it did even a few weeks ago. "There is no prospect of closure in the Brexit debate without respecting the right of voters to have the final say," said former Conservative lawmaker Stephen Dorrell, one of the prominent bipartisan voices behind the campaign for a so-called People's Vote. He added: "It would show our country has finally come to its senses after a spasm that has undermined our democracy. " The argument goes like this: The yes or no referendum in June 2016 showed that most people wanted to leave the E.U. — but it gave little idea what a post-Brexit Britain should look like. Backers say of another vote say any deal thrashed out by lawmakers should be put back to the electorate to make sure that the vision of the future is actually what they wanted. Opponents claim this is a nothing short of a conspiracy cooked up by those who want to cancel Brexit altogether. But supporters say that only a final, definite act of public endorsement can break the impasse. 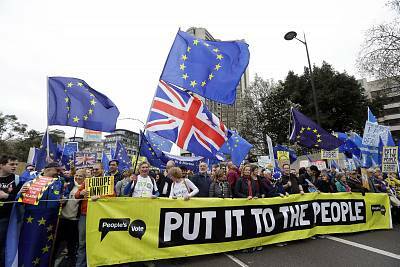 Their cause has been boosted by the hundreds of thousands of demonstrators who marched through London last month calling for another referendum. Furthermore, a parliamentary petition to cancel Brexit altogether gained more than 6 million signatures. For a long time during this process, the idea of another referendum seemed far-fetched, a fantasy reserved for the pro-European fringes desperate for any excuse to remain in the E.U. As recently as December, May outright rejected the idea, saying it would do "irreparable damage" to the public's trust in British politics. A month later, opposition leader Jeremy Corbyn bluntly said his Labour Party was "not supporting or calling for" another referendum. Fast forward to this week and the picture has changed remarkably. May is no longer ruling out the prospect of another vote, and her finance minister, Philip Hammond, told ITV News on Wednesday night that there was a "credible case" for one. That this is even being discussed in the political mainstream shows how limited May's options have become. Because the U.K. is so closely tied to the other 27 E.U. countries, its politicians have been trying to agree on a deal to ensure a smooth divorce as well as a clear path to a future relationship. The prime minister's attempts to secure this have resulted in a stalemate in Parliament — where her plan has been rejected three times — and it has exacerbated bitter divisions within her Conservative Party — with lawmakers of all stripes blaming her for the chaos. "I deeply regret the state of my party, a party that is in a profound state of existential crisis," said Dorrell, the former Conservative lawmaker. In a final throw of the dice, this week May entered into talks with Corbyn, a man on the far-left of his own Labour Party, and someone with whom she has spent the past few years trading vitriolic attacks. These cross-party negotiations are now the focus of the Brexit debate. There is a deep sense of mistrust from both sides. Some Conservatives are outraged at their leader cooperating with a "Marxist" and an "anti-Semite," as one lawmaker, Caroline Johnson, put it, referring to Corbyn's left-wing politics and lingering allegations that he has failed to tackle incidents of anti-Semitism within his ranks. With the talks now underway, Corbyn himself is coming under pressure from all sides of his party about whether to demand a second referendum. There are also fears that the prime minister is laying a trap. Although he campaigned limply to remain in the E.U. in 2016, Corbyn is widely believed to be a euroskeptic at heart. His party has been pulled in at least two directions. Some lawmakers fear that any attempt to frustrate or cancel Brexit will incur a backlash from their working-class, pro-Brexit constituents, often in the north or midlands of England. Other more pro-European voices have appeared keen to drag Corbyn and his colleagues toward a softer approach. Eight lawmakers have already quit the Labour Party over Brexit. Keen to prevent any more rebel departures, Corbyn now says that he backs a second referendum and ordered his lawmakers to vote for such a plan earlier this week. Despite this apparent momentum, there are questions and potential pitfalls. If there is another referendum, which question — or questions — would be on the ballot? The last one was a simple in or out choice. But now there are other options: May's deal, a so-called softer Brexit, a no-deal Brexit, or no Brexit at all. Then there's the result. If it's a narrow vote to remain in the E.U. — a mirror image of the last one — many pro-Brexit supporters would see it as illegitimate. "How many times are we going to vote? Is it going to be the best of three?" asked Northern Irish dockworker named David Henry, 59, during NBC News' Brexit road trip earlier this year. 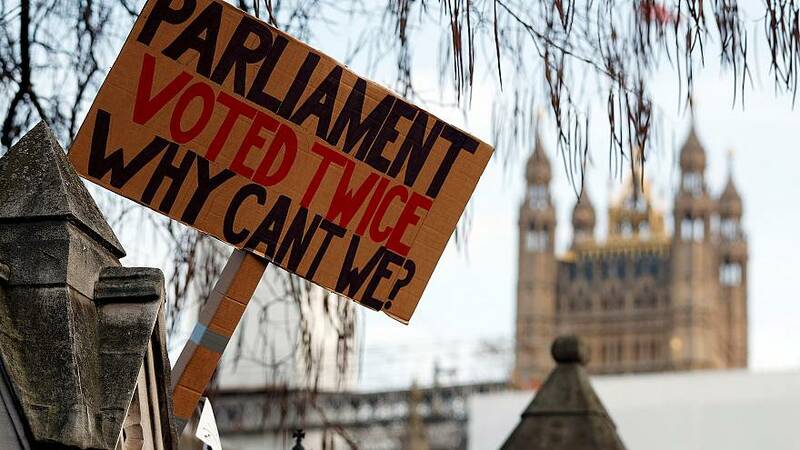 A second referendum carries another wrinkle in that it would force Britain to participate in European elections in May. And even if the result is a decisive vote for staying in the E.U., some officials are worried this could inflame the already venomous atmosphere surrounding Brexit. In December, Foreign Secretary Jeremy Hunt went as far as saying that attempting to reverse Brexit could risk "real social instability," possibly involving that kind of yellow-vest protests seen in France.